Update: The contest is now closed. We will no longer be accepting entries. Thank you to everyone who shared their personal finance advice and entered the contest. Making the right financial decisions by yourself is hard. When you didn’t know what to do, who gave you advice? Maybe it was your mom telling you timeless wisdom like a “penny saved is a penny earned.” Or maybe it was your best friend introducing you to no-fee chequing accounts. We want to know what you learned. 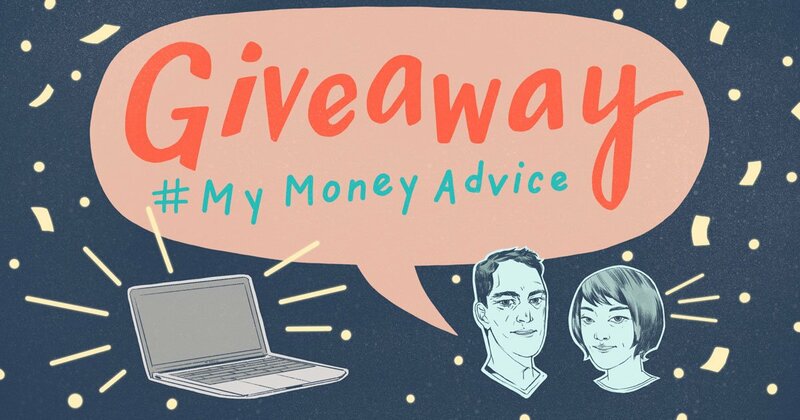 Tell us the best money advice you’ve ever received and you’ll be entered into our #MyMoneyAdvice contest for your chance to win a MacBook. By submitting, you agree to the contest terms & conditions. Thank you for entering! Every year we help millions of Canadians save money on financial products. While you're here, try us out: compare auto insurance prices from 30+ leading insurers. It takes just three minutes to get your quotes. The #MyMoneyAdvice contest begins on September 17th, 2018 at 9 a.m. ET. and ends on November 6th, 2018 at 5 p.m. ET. No purchase necessary to enter. To enter the contest, you must submit your answer for the best personal finance advice and your email address. By submitting your answer for the best personal finance advice, you agree to let LowestRates.ca share it on Facebook, Twitter and Instagram. By submitting your email, you agree to receiving promotional communications from LowestRates.ca. You can unsubscribe any time. ​Any inappropriate messages will not be eligible to win a prize. We will contact the winner via email so keep an eye on your inbox! All of us have been making money decisions since we were young, and can probably think of plenty of mistakes and successes we’ve had along the way. For example, as a kid, you might remember saving up your allowance to buy a toy or video game you wanted. As a teen, you may have used the money from your first pay cheque — your own hard earned money — to go to the movies with friends. But as you got older, managing money likely got less fun. If you’re looking for more tips, we’re here to help! Our MoneyMinded blog covers everything you need to know to help you with your personal finances. Taxes Is it time single people got more tax breaks?